Technology has reached blogging. Miguel of the Devil's is taking pics at the march explained in the preceding post, sending them to me and I am posting the ones that the cell phone did not damage too much. Tonight I suppose he will publish in his blog more exciting ones, but right now, that is it folks, almost live coverage! The march most fashionable T-shirt, courtesy of the King of Spain inspiring words! 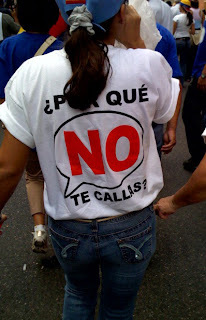 "¿Por que no te callas?" 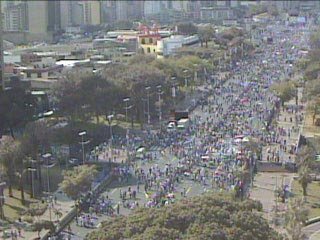 2:20 PM, the Bolivar avenue is starting to fill up. From the same traffic camera from Movilnet, as reported in the previous post. You can monitor yourself here, at least as long as the government does not manage to shut it up. 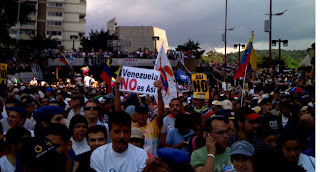 By the way, it seems that the government has denied access to foreign press to the Hilton, now ALBA Caracas, where the press used to gather to cover such events in the past. Miguel sent me an SMS: lines are crowded, he cannot send me pictures but keeps trying. 2:51PM, I cannot access anymore to the Movistar traffic camera. Sabotage? Saturation of the networks? 2:54PM My bad. Must have been saturation. 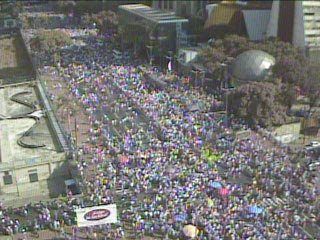 More people, now the East looking side is starting to fill up. 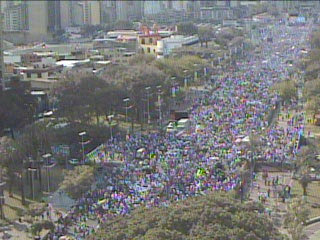 2:57 PM, SMS Miguel, he has reached the Bolivar and says it is full. He must be in that picture. Miguel still cannot transmit images, his mobile system is in trouble. I am posting one last image from the Movistar traffic camera. The holes from the above picture are now filled up, at 3:22 PM. 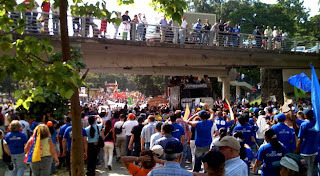 The avenue is packed and the quality of the image does not allow to show more details than what you can see now. Thus, no more Movistar pics for this post. If Miguel does not manage to send me something that will be all until tonight. 4:30 PM Miguel is alive again. This first one is on the way to the Bolivar. This one is inside the Bolivar avenue, looking towards the ALBA hotel. 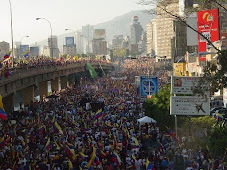 that is: FAR from the center stage where usually Chavez holds his perorations. 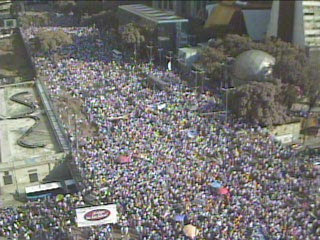 Observe how tightly packed the crowd is. 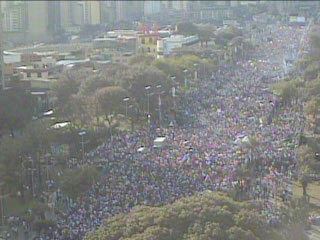 And to finish this post, the view of the Bolivar at 4:02PM. Observe that the little white rectangle at the top right is the center stage. 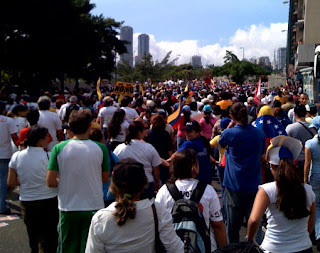 Last time chavismo barely filled up half of what you see, and certainly not with that density. We will see tomorrow what they are able to do. Meanwhile the students can go to bed tonight with a big smile.